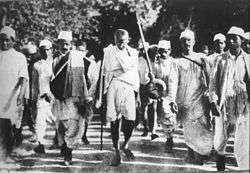 Mahatma Gandhi originated the padayatra with his famous Salt March to Dandi in 1930. In the winter of 1933-34, Gandhi went on a countrywide padayatra against untouchability. Later, Gandhian Vinoba Bhave also started a padyatra, which was part of his Bhoodan movement in 1951. Starting from Telangana region, Bhave concluded his padayatra at Bodh Gaya. On 6 January 1983, Chandra Shekhar started his padayatra from Kanyakumari and continued his 4260 km journey to Raj Ghat in Delhi till 25 June 1983 to understand the problems of masses. Rajagopal, PV, in Janadesh 2007 led 25,000 landless peasants on a 28-day march from Gwalior to Delhi. In 1986, Ramon Magsaysay Award winner Rajendra Singh started padayatras through villages of Rajasthan, promoting construction and revival of johads and check dams. N. Chandrababu Naidu, former chief minister of Andhra Pradesh state, who at the age of 62 years had covered 1700 kilometres as of January 2013 and committed to covering the entirety of Andhra Pradesh; Y. S. Rajasekhara Reddy, who did a three-month-long padyatra covering 1475 kilometres, meeting people across state Andhra Pradesh. The varkaris from the Maharashtra state of western India practice a regular walk to religious places like Dehu, Alandi and Pandharpur. Ashadhi Ekadashi , Kartiki Ekadashi, Maghi Ekadashi and Chaitra Ekadashi are some of the popular days when pilgrims reach Pandharpur to worship Vithoba. Mantralaya Paadayatra to worship saint shri Raghavendra Swamy and Shri Datta Paadayatra to worship lord Dattatreya & Murgod Paadayatra to shri shiva Chidambar swamy are famous from Dharwad city of Karnataka state(India). ↑ Ramachandra Guha (Nov 8, 2005). "Where Gandhi Meets Ambedkar". The Times of India. ↑ David R. Syiemlieh (2005). Reflections From Shillong: Speeches Of M.M. Jacob. Daya Books. p. 135. ISBN 8189233297. Retrieved 9 May 2014. ↑ Manisha (2010). Profiles of Indian Prime Ministers. Mittal Publications. pp. xxi. ISBN 8170999766. Retrieved 9 May 2014. ↑ "The water man of Rajasthan". Frontline (magazine), Volume 18 - Issue 17. Aug 18–31, 2001. ↑ Asghar Ali Engineer (2008). Sufism and Inter-Religious Understanding. Pinnacle Technology. ISBN 1618201689. Retrieved 9 May 2014.